We’re not trying to find excuses here, but sometimes you simply can’t get an accurate shot because you don’t have the right shooting bench (don’t roll your eyes, you know nobody’s that good!). A good shooting bench gives you comfort, convenience and is so well made that basically does the shot for you (no, it doesn’t, but it sure helps you a lot). We think comfort should always come first as it’s very likely you’re going to spend more than just one hour on the shooting bench. There are plenty of shooting benches out there that have a well-padded seat and tabletop. If you are experienced enough, you just know that only this padding isn’t enough and you need great comfort for your arms just as well. Never mind the comfort, but padded armrests could actually improve your precision just as well. The table top area needs to be quite large as you do want to have the ammunition and supplies handy all the time. In addition, let’s not forget you would like the large space on the top for your cold drinks, sunglasses or other personal items you may find so important at the time. None of the above is useful if the craftsmanship is crappy, though. You want your shooting bench to last, to have good quality materials and who gives you stability and a rugged feel. You don’t want to get all of this with the weight though, as you may want to move it around from time to time. If you go for a collapsible bench, you have to check the quality of the hinges and all the other moving parts. Durability is something you’d want on your shooting bench also. Long story short? The best shooting bench needs to be compact, lightweight, portable and with a comfortable, well cushioned padded seat. Don’t take any less than strong steel tubing, with powder-coated finish to protect against the elements. Everything else that comes along is basically a great bonus that may come for an extra buck. 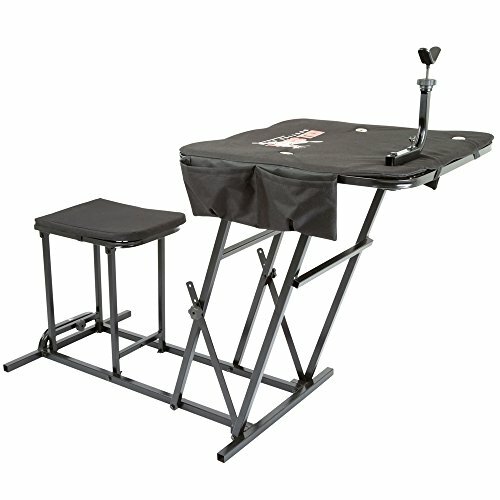 Very easy to set up and to carry around, the X-Stand X-Ecutor Shooting Bench is a dependable option to try. This shooting bench comes at a great price and with many good features. It’s not only easy to use, but also very easy to fold. It gets compact when folded, solving the storage and the transportation problem altogether. The padded seat is comfortable and has a 12” diameter, which is OK for most of us out there. It’s 360 degree swivel and you may also adjust it forward and back for more comfort when shooting. Along with portability and comfort, the shooting bench is also dependable for more accuracy on your shots. The gun rest is micro-adjustable, for accurate tuning. You don’t even have to look at the gun rest for adjustments and you simply turn the job for the adjustments. The gun rest features a non-scratch rubber, which expands its life span. The gun holder is rubber coated, improving the shooting experience. The bench comes with a vinyl padded bench cover that protects your equipment. Nevertheless, the shooting bench still remains a dependable, versatile and portable option for any shooter who likes to move a lot in the field. 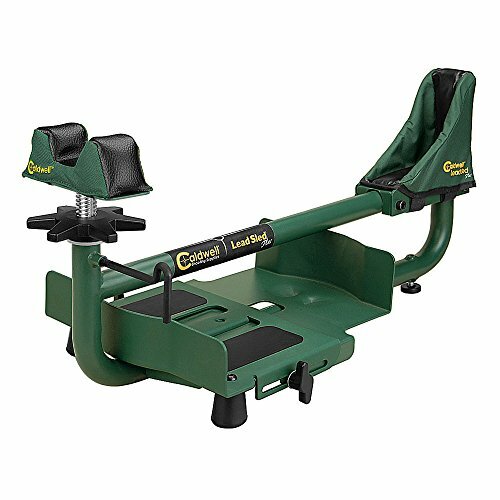 Get comfortable and be ready to shoot in the Muddy Swivel-Action Shooting Bench. The shooting bench has a versatile design and comes with many features that we like. It present a steel construction, which means it’s tough, durable and takes some weight also. When we mentioned the good design, we also had in mind the self-locking 360-degree rotation on both top and seat. They both rotate nice and smoothly. And now that we’re here, we need to mention the padding on both seat and top. Going farther with the details, the shooting bench features a gun rest that gives you precision, in a comfortable way, due to its design and rubber-coat. The gun rest is highly adjustable, which is so nice. As for the functional details, we really like the built-in shell pouches that are great for storing the extra ammo. In addition, they are very well placed, on the sides. 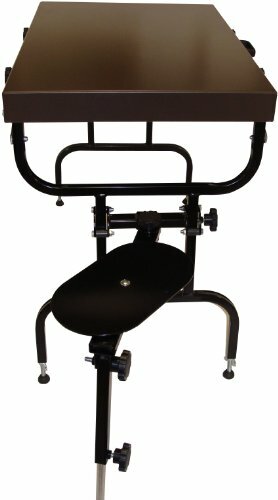 The shooting bench is user friendly, very easy to put together/take down. It’s comfortable to use and has a strong, reliable build. It comes with a vinyl cover that protects it from the elements. 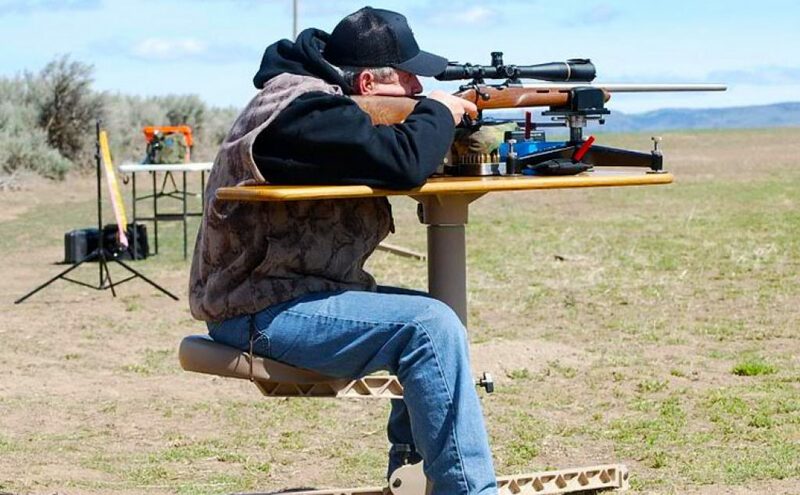 Despite the minimal draw backs, the shooting bench is still an option that is worth to try for your shooting experiences. 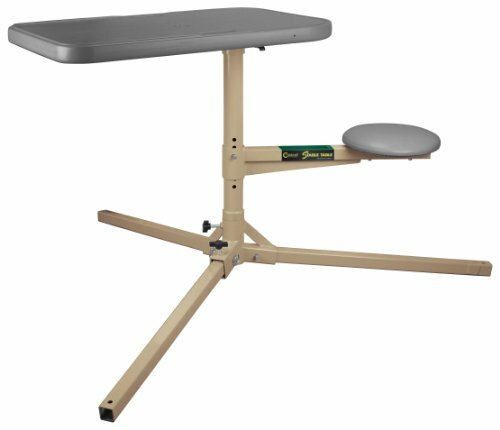 If you want to shoot in one place, and not carry around your shooting bench that much, give it a go with the totally dependable Stable Table from Caldwell. The shooting table features 360-degree rotation, which gives you a lot of freedom and versatility on your shooting. There are many features we like on the shooting table and the removable cleaning forks so that you may use it also as a cleaning station is just one of them. The table has a tripod design, which is rigid and stable, with minimal joints. You may adjust the single leg thanks to the bolt in the base so that you get a parallel alignment of the tabletop with the horizon. You may pivot around a center axis as a single unit the seat, tabletop and the central shaft- and this is great for varmint hunting. You get to lock the bench into a single shooting position if that suits you best. If we take a look at the materials, we see the tabletop is made of molded plastic and the under-frame is made of tough, right metal. The entire frame is made from welded steel, which explains the stability and durability of the shooting table. As for the comfort part, we notice the seat that is well padded and is adjustable (from 16” to 22”). The seat also rotates along with the tabletop. The setup is easy and the shooting bench breaks down into 7 pieces. The weatherproof synthetic top protect the bench, whereas the molded carrying handles increase the portability. Despite the minimal issues, as it’s versatile, rugged and sturdy, the shooting bench makes it as a great choice for any hunter. If you train using paintballs, you won’t have any problems getting good support from this table, or any table on this page. See this partner site for a selection of the best paintball guns. Compact and easy to store, the Benchmaster – Shooting Table is a nice investment to make by any dedicated shooter. It’s an attractive option for the long-range shooter, to be more precise. The shooting bench comes with sturdy steel legs that give stability and longer life span. The shooting table is foldable and becomes compact so it’s so easy to store it and carry around. It comes with built-in carry handles, which increase its portability. The shooting table/bench comes with many adjustments options so it’s highly versatile. It actually provides 12 different adjustment points to help you get the right shot. Each leg as adjustments of its own to level the table on various surfaces. The table area is very large and gives you plenty of space to display your accessories. The durability of the shooting bench shouldn’t be a matter of concern for you as the entire setup is powder coated, for protection against the elements. All the components are made of quality materials and are durable, with lifetime warranty. The seat is comfortable and features swivel so you get more shooting possibilities. It’s also expandable from 8” to 19”. You may also position it for left or right hand use, with a full 170-degree adjustment. Never mind the cons though as they are rather minor and the entire assembly is durable, versatile and dependable for most shooters out there. Just because you’re not willing to pay an arm and a leg for your shooting bench, it doesn’t mean you can’t find a good quality bench for a fair price. 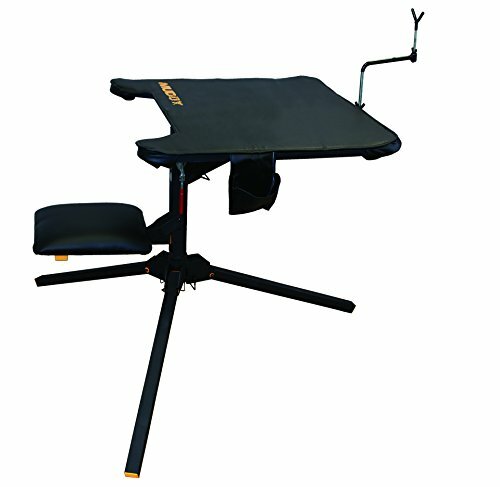 You don’t need to be a rocket scientist to know that for the money you pay, you get quite a good deal with the Kill Shot Portable Shooting Bench Seat with Adjustable Table Gun Rest. The shooting bench is quite big but it’s foldable. It’s compact when folded, which makes it easy to carry around and store. The seat has 12-inch diameter, which is fine for most of us out there. It swivels 360 degrees, which gives you a good range of positions and also adjusts forward and back for better reaches in various situations. The gun rest has a great design, which makes it easy to use for all shooters. The V-yoke design in the front is adjustable in the height and swivels for best comfort, no matter if you are right or left handed shooter. The gun rest is adjustable to any position and the non-scratch rubber coat protects it and expands its life span. The list of things we like doesn’t end here and we also need to mention the bench top cover with padded vinyl for better protection. In addition, in case this isn’t enough for you, note the two shell/gear pouches that are so helpful to store more ammo. The steel tubing on the shooting bench gives its stability and rugged build. The bench is dependable and made for the heavy-duty jobs. No matter the cons, we still think the shooting bench is a good option, for a fair price. 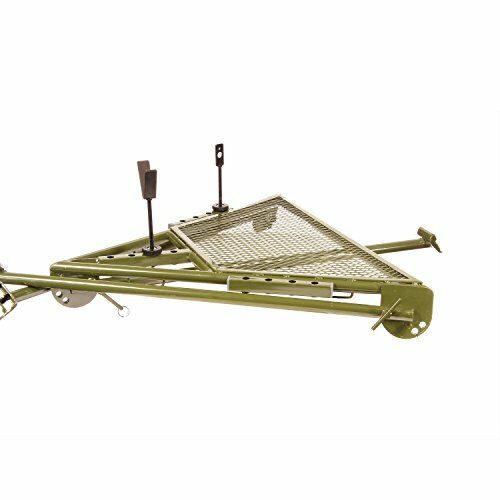 If you like to move a lot in the field, a portable shooting bench is the natural choice for you. 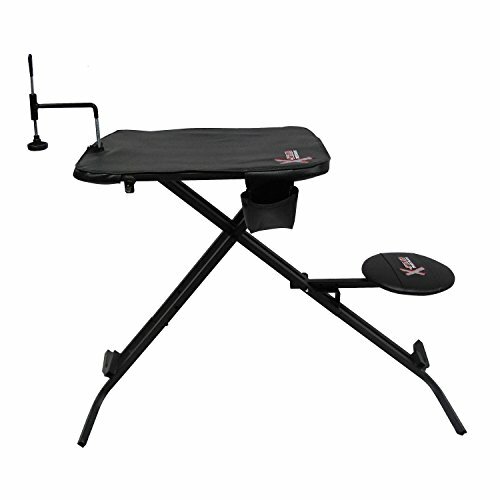 The Hyskore Ten Ring Portable Bench is very well made and has a heavy-duty build, without losing out on portability. The shooting bench has a rigid tubular frame that ensures its stability. It’s lightweight (less than 20lbs) so it’s very easy to carry it around. When you want to carry it, it’s important to know the bench folds easy and compact, which is what you want in the first place on the shooting bench. The integral spotting scope mount so you may attach it to left or right side, just the way you need. In addition, it’s also adjustable for height and eye relief, which is so convenient. As giving precise shooting is so important on a shooting bench, we need to mention the padded V-notch gun support on the bench. It has adjustable elevation and has 4 hard point mounts so that it takes so many gun lengths and shooting styles. The shooting bench is designed to handle both field and range shooting environments. Therefore, versatility is a great quality of the shooting bench. You don’t need to worry about the durability of the bench either. The legs are attached with tough MG-42 Machine Gun Rest style connection points so you may get 2 various elevations. The storage/transport position is also very well secured with M 12T-bolts. The heavy-duty steel and the tubular sections with strong (yet lightweight) mesh deck create a rugged, long lasting shooting bench. On top of everything, the long lasting powder coat finish protects the bench against the elements, expanding its lifespan. The shooting bench is easy to use and has great stable traction on all kinds of surfaces. All in all, for the portability, strong build and the durability, the shooting bench is a sure buy for the active hunter anytime. If you are into the bench shooting, the Caldwell Lead Sled Plus Recoil Reducing Rifle Rest is definitely a device to have. The bench rest is a no.1 option for the magnum rifles and slug guns and presents many features that prove its efficiency. The Lead Sled DFT (Dual-Frame Technology) gives you a great recoil reduction system and the ability to fit any shotgun or rifle and is built around the precision shooting platform. The device comes with adjustable weight tray slides so it may accommodate bar bell weights and weigh bags just as well. It has a strong build and can take up to 25lb. bar bell weight and up to 100lbs. of lead shot. The new “no wobble” elevation ram gives you more accuracy on shoots. When it comes to recoil, the bench rest is actually able to lower weapon recoil by up to 95% while keeping gun on target. The precision elevation shaft eliminates wobble. The list of features also includes the non-marring rubber feet that make the bench rest more stable. In terms of versatility, the bench rest is a good example as it may accommodate various weight types, from sand, barbells to lead shot bags. The adjustments you can do on the shooting bench are fine and the fingertip control makes it easier also. Let’s not forget the good shooting position that the rest ensures through the elevation corrections with the rear elevation collar. Additionally, the stock-stabilizer rear bag minimizes risk for stock shift between shots. Last, but not least, the multi-surface rear foot ensure good contact, no matter the shooting surface type. Despite the minimal issues, the bench rest sure is reliable, rugged, durable and gives you better precision, eliminating recoil just as well. 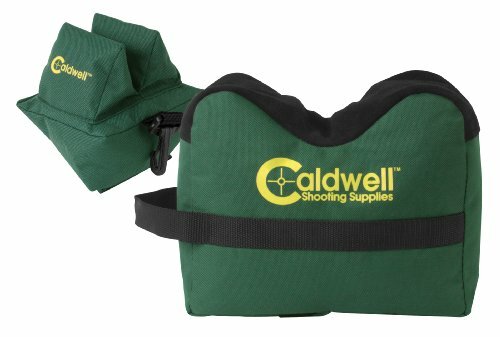 For the know-it-all/do-it-all shooter a great option for bench rest-shooting bags are the DeadShot Boxed Combo. First of all, the set of shooting bags comes unfilled so it’s really up to you to fill them. The filling is quite easy to do and the instruction that comes along is sure easy to follow. You get to fill the bags as much as you want, according to your comfort and needs. In addition, you get to use what filling suits you the most. Some would typically go with the beanbag stuffing; some would use the birdseed. You can also get some help from the walnut husk, if that’s your liking. It’s basically up to you, which type of filling you want to go with. Just don’t use rice- as good as, it sounds, it’s not the best option. The bags are made of long lasting 600-denier polyester. The seams are very well made and the bags are well sealed. The material is also water resistant, which is always a nice feature. In terms of features, we also notice the quick-connect feature that gives the bags reliable portability. You can easily carry around the bags on the field. The bags are very well made, lightweight and make it as great option for rifles with fixed stock. They have good quality materials and the top surface is made of real leather (soft suede). All in all, for a good price, you get reliable, easy to fill bags that come with many good things and only few drawbacks. Giving you the precision you need for your shoots, the Harris Engineering S-BRM Hinged Base 6 – 9-Inch BiPod is not only very well made, but also comes with plenty of functional features. The bipod is highly lightweight which makes it incredibly easy to carry around. It expands from 6” to 9”, using the leg notches. The list of features includes the swiveling ability of the bipod, which is so helpful when shooting from uneven surface. The legs are spring loaded so the deployment isn’t just smooth, but also very fast. The bipod also features a built-in sling swivel stud so you may attach the sling. We also notice the leg notches in 1” increments. The lightweight of the bipod doesn’t minimize its stability, but actually sustains it. The bipod is very well made and has a rugged construction, without adding the weight. It’s definitely a long lasting bipod as it also comes with a lifetime warranty. The bipod is highly versatile and you can use it for any rifle. The rugged build makes it also up for the heavy guns. The rugged build of the bipod gives you confidence. The spring-loaded deployment is reliable and the flip up legs are easy to operate. You can securely mount the bipod when in need. Very well made and easy to use, the bipod comes for a great price, which may be essential to some. Cons or no cons, the bipod is still ready for so many shooting situations, for a very long time. Check this page if you are looking for Binoculars for Hunting.